E-learning has over the years become a channel for a lot of educational institutions and organizations in developed economies to effectively disseminate information as well as teach and train individuals, groups and corporate entities with a wide range of subjects and its related opportunities. There is more to do in the educational front in developing countries, do the merits of e-learning outweigh its inherent demerits? Can developing countries take advantage of this channel to augment the current educational infrastructure in place thus widening its reach? To investigate this phenomenon, the research question is stated as: ‘what are the opportunities of e-learning in developing countries and for that matter Ghana’. The paper uses exploratory research approach and which applies a survey of 3 polytechnics in Ghana. The sampling frame is the business department with sampling type made up of both third-year students and selected teachers from the same business unit. Finally, the sampling size is set out to be 150 students representing 50 students per institution and 15 teachers representing five teachers per institution. The questionnaire adopts mix strategy approach including open ended and Likert styled ranging from 1 – 5 as in strongly disagree to strongly agree. The data was analyzed using Google Form and by careful interpretations, the results were projected in both bar and pie charts to present a quick overview of the findings. On the demerit side, it was discovered that inadequate or non-availability of the proper hardware and network infrastructure hinders the adoption and diffusion process of e-learning. More so, the current cost for e-learning implementation including time constraints for teachers who may be willing to try it was stated as barriers. Nonetheless, the merits included potential equivalency in certification, time and cost saving when properly utilized, replicability of materials used. In the part of the students, the notable merit is the ability of e-learning in helping to develop latent competence needed in work life. Finally, for an effective implementation, the research discovered that participation of stakeholders especially the government is paramount. Education Ministry of Ghana, as well as private institutions, have to carefully analyze, plan and finance all the educational sectors as well as creating a centralized platform for which data will be generated, stored and shared among stakeholders. E-learning or online learning has become very popular in developed countries, where most educational institutions have offered courses online already for long. In recent years, e-learning has been adopted in developing countries as well. The hypothesis is that despite possible challenges due to technical and financial matters, e-learning can prove to be an interesting and efficient way of facilitating learning also in developing countries. At the moment there is a clear research gap in earlier research on e-learning in developing countries, since it is a fairly new phenomenon there. The objective of this study was to find out what the opportunities of e-learning in developing countries are based on the case country Ghana. The target organizations studied are educational institutions in Ghana that correspond to the polytechnic or university of applied sciences level in Finland. The respondents are studying or teaching in the field of business. The theme is investigated from both students’ and teachers’ point of view. According to IMF, 2016 and WB, 2016; developing countries are such countries with relatively low human development index or less industrial basis in its economic sector. Furthermore, the criteria of a developing country can be evaluated in various ways including lower life expectancy, literacy rate, income and higher birth rate. International Monetary Fund (IMF) considers per capita income, export diversification and condition in global financial system to evaluate a country whether it is developed or developing country. For instance, a less developed or developing country can be categorized in the less income group if it has GNI per capita of income US$1,025 or less. Nonetheless, The World Bank thinks the concept of dividing countries into developing and developed is outdated. According to the aforementioned characteristics, Ghana can be categorized as a developing country. To begin with, e-library services and learning online has been initiated by institutions due to the preference of maintaining one’s job proximity and studying at the same time. The African continent has had impressive adoption curve in areas pertaining to communication and technologies; this is laudable because the continent is moving at a pace well noticeable in infrastructural development (Rohleder et al., 2008). The adoption and diffusion rate of cell phone technologies in recent times for example in Ghana and other developing countries in Africa has provided new prospect for economic growth. E-learning is gaining a lot of attention in developing countries in Africa, in Tanzania for instance, secondary education is going through transformation in terms of integration of e-learning into the educational system, comprehension of these facts brings sparks of optimism in the future of e-learning. However, challenges such as shortage of textbooks, teaching and learning materials and of course pedagogical skills required for teachers to deliver content electronically is seen in most cases (Olson et al; 2011). In Ghana, there are 10 polytechnics in all, one in each of the 10 regions. Most Ghanaians get access to enroll into polytechnics not just because of the number but also the fact that these institutions provide relevant technical skills that is significant for the development of the country. Polytechnics were meant to be technical institutes providing tuition in craftsmanship for second cycle education in the 1960s. Due to rapid growth in technology, there was the need to supply manpower to fill up gaps. In view of this, technical institutes were established to train skilled personnel to hold various gap positions (Nsiah-Gyabaah, 2005). The integration of technology in teaching practices of most teachers in Ghana and other developing countries is a major challenge, the concept of “chalk and talk” where the teacher is the center of attention in a class is still in practice. However, some teachers in higher institutions such Ho Polytechnic in the Volta region is blending old methodology with the use of technology to create e-learning solutions. Polytechnics in Ghana are now offering full time courses, ranging from applied arts, applied social sciences, commerce, science and technology and manufacturing. The idea about encouraging technical courses at the tertiary level has always been the major idea behind the upgrade of the statuses of these institutions (Ministry of Education, 1993). The duration for Polytechnic education in Ghana is three years as determined by the Polytechnic law, which directs the administration, grading and certification. Nonetheless, Authorities at polytechnic institutions have the right to redesign the curricula and provision of developmental Ideas which they deem appropriate for the smooth management of the school (Ministry of Education, 1993). It is obvious that e-learning is growing fast and it is no surprise, because e-learning gives a chance for learning to anyone (Vainionpää 2006). Furthermore, most e-learning platforms are not time sensitive, thus no matter where you live, or what time of the day or week best suits to your calendar, you are able to join. It gives a student the opportunity to study at their own pace and a chance for teachers and educational institutions to reach a much wider audience. E-learning gives a chance to study even at night, if that is the preferred choice of the student. All you need is a computer, a good Internet connection and the willingness to learn. Due to ease of access to information, people with high mobility due to business life are able to access materials so far as they have the pre-requisite electronic tools. The following paragraphs present a summary of some of the most common and best opportunities of e-learning. E-learning gives the opportunity different learners including some who are unable or unlikely to join traditional classroom to have access to quality education. By expanding the basic infrastructure including computer and internet service from schools to convenient location accessible all sort of people, facilitating learning becomes easier (Vainionpää, 2006). E-learning also promotes equality. For socially reserved (i.e. shy people), it may be easier to communicate with teacher and students in e-learning context than it would be in face-to-face learning. In Vainionpää (2006) research, one of the results was that there could not be found almost any difference between women and men, for example, in e-learning experiences. The result can be interpreted such that in the information age we live in e-learning is not gender bias (Vainionpää, 2006). When it comes to acquiring new information, there are no age limits. Furthermore, social media can often be used as a tool for learning. In that case, it should be remembered that there is an age limit of 13 in many social media platforms and services. But generally speaking, in so many instances, studying online does not have any age limits. This means that even elderly people may take the online courses (Vainionpää, 2006). One opportunity that e-learning environment provides is that it can contribute to learners’ ability to regulate the amount of social contacts and the quality of interaction, this includes its ability to provide learners with a wide range of possibilities for mutual communication with different kinds of tools for both written and oral communication (Vuopala, 2013). So, there is no doubt that with effective and interesting communication tools, e-learning can promote students’ community skills. According to Myllylä, Mäkelä & Torp (2009, 128) an active discussion and communication in e-learning also contributes cognitive conflicts which are important for learning, and for which it is essential that forum messages are written in own words not by copying theories. Students with children need flexibility with their studies. E-learning gives students with families a chance to go forward with their studies as planned. They may study when children are sleeping or early in the morning, literally whatever suits them best. One of the best opportunities of e-learning is the flexibility with time. It gives the students a chance to study at what time of the day or week they want and when best suits them. This also improves the organizing skills of students because they have more responsibility of their timing and studies as well. E-learning, at its best, promotes the equality of education. E-learning gives also flexibility to family planning in the context of family social event and in that way, e-learning has a strong social significance (Vainionpää, 2006). From the student’s point of view, one advantage of e-learning is that in online environment, the student often receives more personal guidance than in class (Suominen & Nurmela, 2011). So, e-learning gives a chance to offer supervision online, outside the classroom as well as the ability to reuse the content and material of the course. This means that it is easier to go back to the material and documents studied during the course (Vainionpää 2006). It is obvious that people often move to big cities to study. In media, we often read and watch issues pertaining to rural depopulation. With increasing e-learning supply, we can meet this challenge of depopulation. E-learning gives greater opportunity for those living far away from big cities (Vainionpää 2006). It is obvious that e-learning involves computer or a mobile device and a good and reliable Internet connection. Without these, studying online is impossible. Usually, in developing countries the accessibility is limited to libraries, cafeterias or in other public places but generally studying online is so intensive that an own computer and an effective Internet connection is necessary. This is a challenge for those who do not have the devices or for those with a poor Internet connection. According to Vainionpää (2006, 201-202) research, studying at home with a quality Internet connection brings meaningful and positive experience on the learning. In contemporary times, young people and kids who were raised around mobile devices often feel very comfortable using mobile devices, laptops and surfing the Internet. Sometimes we forget that not everybody have such a great computer skills. For those, the challenge of e-learning is the computer skills. This is a challenge for teachers as well, because they have to both have the know-how of the e-learning programs they are using for teaching but also have a competence to give support to students for using the programs. According to Vainionpää (2006, 48), it is essential for successful e-learning, that the student is not hindered by a lack of e-skills and computer skills. Kekkonen & Lappalainen (2009, 81) remind that technical competence or incompetence is something that should be taken into consideration while planning online courses. Another challenge for e-learning is that some teachers as facilitators often find it more burdensome and time consuming to set up. One of the reasons for the burden is that e-learning is more difficult to some in the point of view of evaluation (Vainionpää 2006, 202). So, the challenge is how to share the burden of the teachers that have e-learning courses. The problem of timing in e-learning is that the time splits into smaller units and is much harder to predict (Suominen & Nurmela: 2011, 235). On the other hand, Auvinen (2015, 13) reminds that e-learning environment actually gives opportunities for automating guidance which should ease the workload of the teacher a little bit. For some students, there might be a challenge that there is no face-to-face guidance. This means that they have to regulate their own learning (Auvinen 2015). The study adopts a mix strategy, where a researcher uses both primary and secondary sources of data to arrive at a realistic conclusion of a phenomenon, in this case opportunities of e-learning in developing countries and for that matter its availability and implementation in Ghana. Furthermore, the study uses mixed research approach to help ascertain if the theoretical approach have any merit and justification in the context under investigation (Saunders et al, 2003; Ghauri et al, 2002). The study is built on the premise that e-learning is great and that there are opportunity for such in developing countries. Nevertheless, since the study is focused on a specific developing country, Ghana, it has become necessary for the researchers involved in the study to ascertain if e-learning is in use in higher education in Ghana, how is it implemented, what are the readily seen opportunities, challenges and even what type of tools are in use in the case country. Applying a mix approach helps establish the fact in such a way that devoid the results from any form of bias from researchers involved in the investigation. More so, after preliminary brainstorming, researchers agreed to investigate the phenomenon by sending a survey to three polytechnics in Ghana. The targeted respondents were, firstly, final year students (3rd year) since they may have had enough time to understand and directly use a specific or multiple e-learning platforms, tools and even completed courses by such medium. The original targeted sample response was supposed to be 150, but a total of 120 responses were received from the students. Secondly, the targeted total sample size for teachers was 15 that are at least five from each of the targeted polytechnics. Nonetheless, only 10 responses were finally received from the teachers. The questionnaire for teachers was sent separately from that of the students. 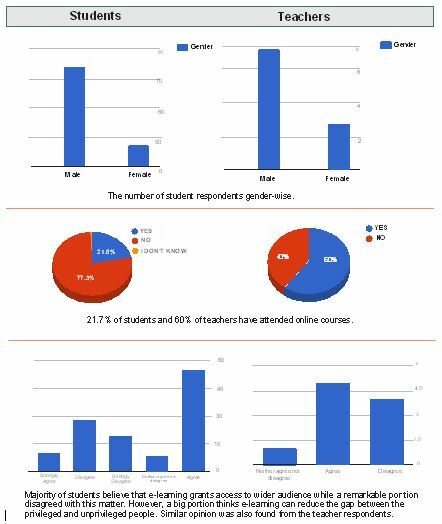 When it comes to the gender of the respondents, 73 of the students were male and 47 were female, and 7 of the teachers were male and 3 were female. The total number of questions for teachers was 18 of which seven were open ended, whilst that for students was 14 of which six were open ended. It is worth mentioning that Likert scale style questions were also adopted in both questionnaires for which a measurement of strongly agree to strongly disagree was implemented. The use of such scale helps to quantify results to further see the number of teachers and students who have used e-learning. The research questions generally seek the view of people’s engagement in using various web based applications as a tool to facilitate learning as far as e-learning is concern. We also seek the views of our target group to know how plausible it is to implement e-learning with all the possible challenges regarding access to internet connectivity, devices and software which support e-learning. The results are presented in the form of a pictograph below. This study brought to light that to facilitate e-learning, the government of developing countries and for this instance Ghana and its education ministry have to analyze, plan and finance adequately all educational institutions to enable them implement e-learning services in all schools. Nevertheless, private stakeholders can equally help in this accord to promote and properly disseminate opportunities of e-learning. Furthermore, another approach will be setting up a centralized platform for which the materials can be standardized and made available and accessible to both students and teachers nationwide. This will promote cost effective educational practice that will help bridge the gap between the privilege and the less privilege in society. It is also important for both teachers and students to be given adequate training in accessing this platform to help them reach the unified objective mentioned earlier. This leads to future research possibilities which could include but not limited to how e-learning could be financed, how e-learning content can be development and be made accessible to stakeholders as well as monitoring the frequency of updates and upgrade of both content and platforms utilized in e-learning. E-learning has a future in making the world a better place through learning, creating awareness and bridging the gap between the privileged and less privileged in developing countries. Auvinen, T. (2015). Educational Technologies for Supporting Self-Regulated Learning in Online Learning Environment. Helsinki: Unigrafia Oy. Ghauri, P., Gronhaug, K (2002). Research Methods in Business Studies: A practical guide. 2nd edition, Pearson Education Limited. ISBN 0273-65110-2. Myllylä, M., Mäkelä, R. & Torp, H. (2009), “Digitaaliset narratiivit ohjauksen haasteena opettajakoulutuksen verkkokeskusteluissa”, in Ihanainen, P., Kalli, P. & Kiviniemi, K. (eds. ), Verkon varassa: Opetuksen pedagoginen kehittäminen verkkoympäristössä. Tampere: Tampereen Yliopistopaino Oy Juvenes Print. Olson, Jennifer (October, 2011) An Analysis of e-Learning Impacts & Best Practices in Developing Countries With Reference to Secondary School Education in Tanzania. Michigan State University. Saunders, A., Lewis, P. and Thornhill, A.(2003). Research Methods for Business Students. 3rd Edition. Pearson Education Limited. ISBN 0-273-65804-2. Suominen, R. & Nurmela, S. (2011). Verkko-opettaja. Helsinki: WSOYpro. Vainionpää, J. (2006). Erilaiset oppijat ja oppimateriaalit verkko-opiskelussa. Tampere: Tampereen Yliopistopaino Oy Juvenes Print. Vuopala, E. (2013). Onnistuneen yhteisöllisen verkko-oppimisen edellytykset. Tampere: Juvenes Print.